The mission of One Love Animal Rescue, Inc. is to help abandoned, neglected, abused and unwanted pets by partnering with shelters, rescue groups and the community to facilitate adoption of these animals into permanent and loving homes. 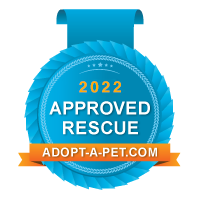 Our goal is to save one life at a time by promoting local animal shelter adoptions and raising awareness in our community about responsible pet ownership. We strive to highlight the importance of spaying or neutering pets which will aid in the reduction of overpopulation. We believe that appropriate and positive reinforcement training and socialization of these shelter animals will lead to well-adjusted family pets, thereby decreasing the number of abandoned animals in shelters. Our dream is that one day all the shelters will be empty because every pet will have a home. One Love Animal Rescue, Inc. of Savannah, GA is a licensed non-profit 501(c)(3) rescue organization; all donations are tax deductible and directly benefit the animals entrusted in our care. Help us give the Abused and Neglected a Better Life. Every dollar helps!